We invite you to stop by our bar for our happy hours that feature live music shows and more. 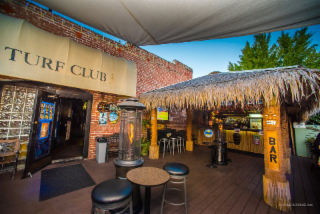 Everyone is welcome to stop by our tiki and outdoor patio bar for happy hours. Browse our events calendar online, and you’ll notice that we feature karaoke twice a week and a weekly dart league. Our pool table is available most of the time when the back of our facility isn’t being used as a dance club! Our unique outdoor patio bar has been transformed into an oasis featuring a large tiki bar. Follow the ramp to the lower patio, and you’ll gain an overview of a waterfall and our gazebo. This area is always featuring live music, including blues, jazz, soul, and rock acts. We also feature a large garden seating area and paved deck that can accommodate parties, private events, meetings, BBQs, and get-togethers for a wide variety of groups.